My love for music began when I heard “Venus” by the SHOKING BLUE. This single, 45 became an obsession as I try to analyse this new sound, called ROCKN’ROLL. I grew up with the LED ZEPPLIN’s riffs, the progressions from GENESIS and the out of the world atmosphere from the PINK FLOYD. I was thirteen years old when I began to play the guitar, a Fender Telecaster Deluxe, on which I played “Smoke on the water”. As I tryed to find, in vain, a singer, I finally decided to sing my-self and became, singer, author, composer, and guitar player. My first concert was a little disappointing because people were more impressed by my voice than by my playing the guitar. Since I played in several bands, I was more and more interested in the sound and its characteristics, that’s why I decided to undergo a training in the STUDIO du RHIN with Alain Klem in order to become a sound engineer. During a jam session, the JADES asked me to sing with them. This band was already famous in the region and they played a really good kind of rock with progressive tendancies. Altough I was unhappy to leave my guitar, I took the job. After having recorded a demo and played about twenty concerts and won awards during competitions, JADES split up. After this success, I sang for several bands in aera of Mulhouse, like BURNING PRIDE, FIRE STRING, ZONE X. In the same time I worked for a music shop called AUX GUITARES where I worked as a sound technician, a stringed instrument maker, and a shop-assistant. As I replaced the singer of the band SWORD I was in a watershed. SONO LIGHT was created thanks to its musicians my material and knowledge. In the mean time and after a change in the band, SWORD changed its name for LOCK-OUT. On the one hand this fusion gave me the opportunity to play and record my own music and on the other hand it me gave the opportunity to work as a sound engineer for famous artists with different kind of music. I have worked in recording studio and have more then fifty demos and CD including LOCK-OUT, MERCYLESS, CRUSHER, PENETRATOR, ALEISTER, MESTEMA and different other compilations to my credit. 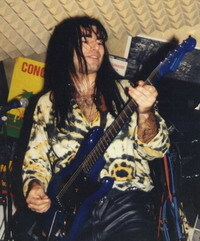 At the same time LOCK-OUT gave a lot of concerts and festivals around France, Germany, Switzerland. In 1994, after two demos, the band signed with the German label AUROPHON (TOAD, TOKYO BLADE, BRAINSTORM) to make and market its first album called “Thélème”. The CD is a production of Vic VERGEAT (TOAD, PAGANINI, GOTTHARD, KROKUS) and recorded by Marcus WASSMER (PINK CREAM 69) in the Baslian (CH) studio “ATLAN”. “Thélème “ received favourable reviews from the international press and during its presentation, in the MIDEM in Cannes. In 1996 the second CD of LOCK-OUT “ Etrange affaire” is launched and produced this time by André ULMAN the manager of AUROPHON and recorded in Basel by Tom Strebel (AEROSMITH, GOTTHARD, Roger Quested) in the BLACKWOOD studio. Then we were often on tour, appeared in different festivals, were top of the bill and played the first part from the concert of the MAMA’S BOYS, VICTORY.And finally in spite of our being played several times on the radio, and even screening on M6, FRANCE 3, the band split up. I was very desappointed by this decision and I decided to quit the musical environment and devote my life to my second passion, the voyages. India is a magical country, I lived there for one year. It brought me peace and a real changed of scene. It also offered me inspiration as I played the guitar during unforgettable Ragas on the beaches in Goa, Gokarna or Mahabalipuram. In Indonesia I discovered the most welcoming people I’ve ever met in Asia while I was trekking on the top of volcanos and on the green terraced rice-fields. After the birth of my both sons Jeremy and Kilyan, I resumed music but this time I stood alone in my own home studio. I’ve finished the recording of my solo albums, it is only instrumental and represents my emotions during my trips, it is paying tribute to the music which inspires me so much all along my life. 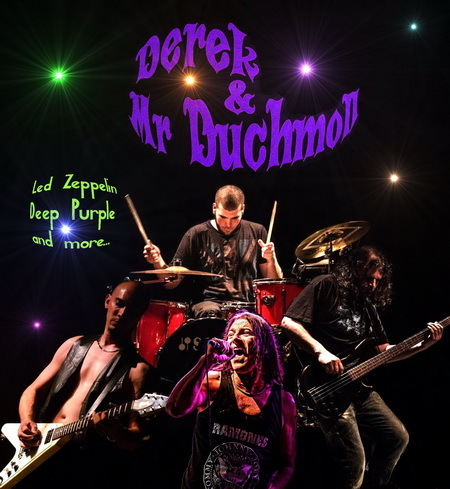 03/16/2006 Release of DEREK "On The Beach"
12/03/2006 Release of DEREK "Wild and Free"
Back to stage as singer with Derek & Mr Duchmoll and guest cover for various other Bands. Also in Asia with more than 23 bands (Hard Rock Cafe & Hotel Bali). 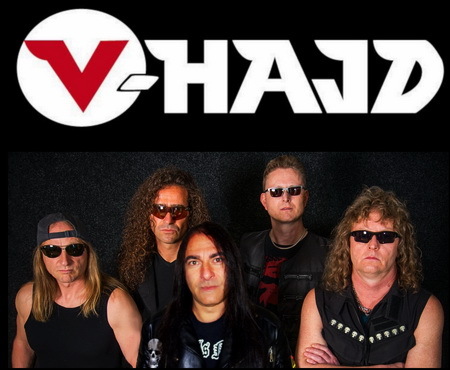 Release of 2 singles "Spirit Of The Jungle" and " Walk On"
I join V-HAJD as singer and songwriter.